It started with a phone call from Dan Youngs. 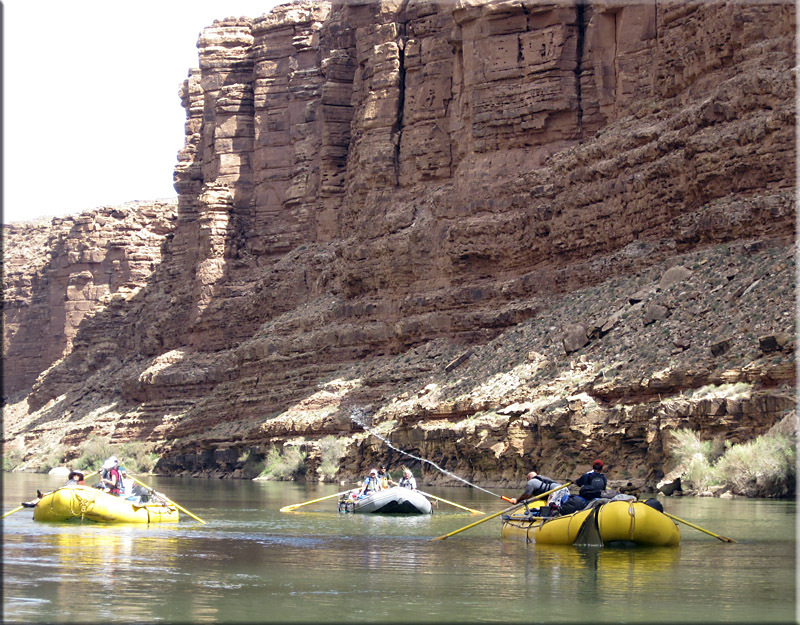 "I have a permit for a non-guided raft trip of the Grand Canyon. Just bring your swim suit. Everything is provided." "When are we talking about," I asked. "We have to meet at 9AM in Flagstaff this Sunday." Wow, that was five days away. Dan asked me to call everyone I knew that might be interested. He had slots for 16 people. I asked him for 24 hours to decide and then emailed about a dozen friends that enjoy such experiences. The price was fantastic, one third of the normal guided tour price. 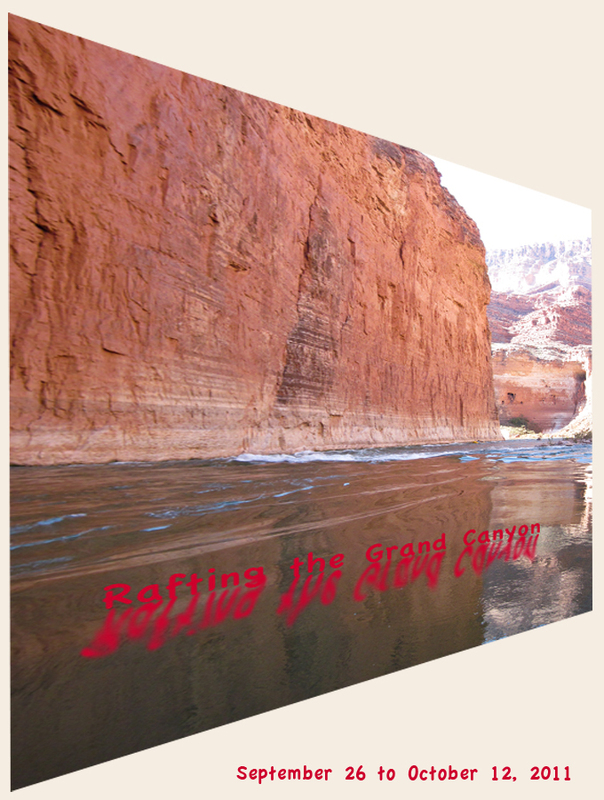 I knew that Dan had hiked the canyon extensively and that he had been down it once in a raft. This was truly a one time opportunity. I cleared my schedule and called Dan the next day. My long time Navy friend, Charlie, and I would join the trip. Moenkopi River Works would provide the rafts, river gear and food. Their list of what we should bring was a bit more than a swim suit; it filled an army duffel bag, but it was still far less than what would be needed if we provided everything. I met Charlie in Sacramento, and together we drove 800 miles through Nevada and Arizona to Flagstaff. We arrived at the "Riverhouse," a suitable bunkhouse provided by Moenkopi, and were surprised to find that all 16 slots on the trip had been filled. We would have a full complement on five rafts. 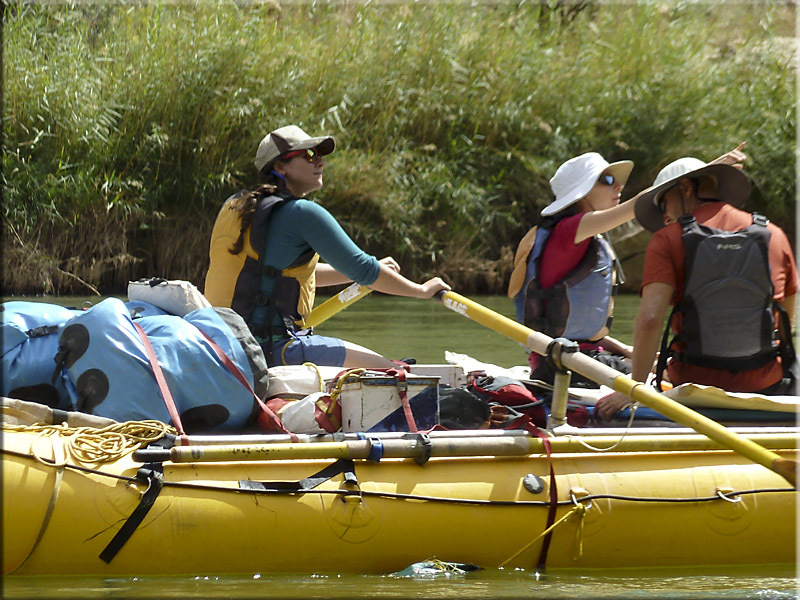 Dan had found about 10 friends willing to come, and the outfitter had filled the remaining slots, mostly with hotshots, firefighters, with the Flagstaff division of the Forest Service. We were each given a large dry bag in which to transfer our personal gear. We were also provided with a sleeping pad and a folding camp chair. Our other necessary items awaited us at the river. We were told to use the remaining Saturday evening hours to buy beer. Beer? I'm a kayaker, and if one takes a toothbrush one must leave something else behind. I watched in amazement as cases of beer were purchased for a raft trip. 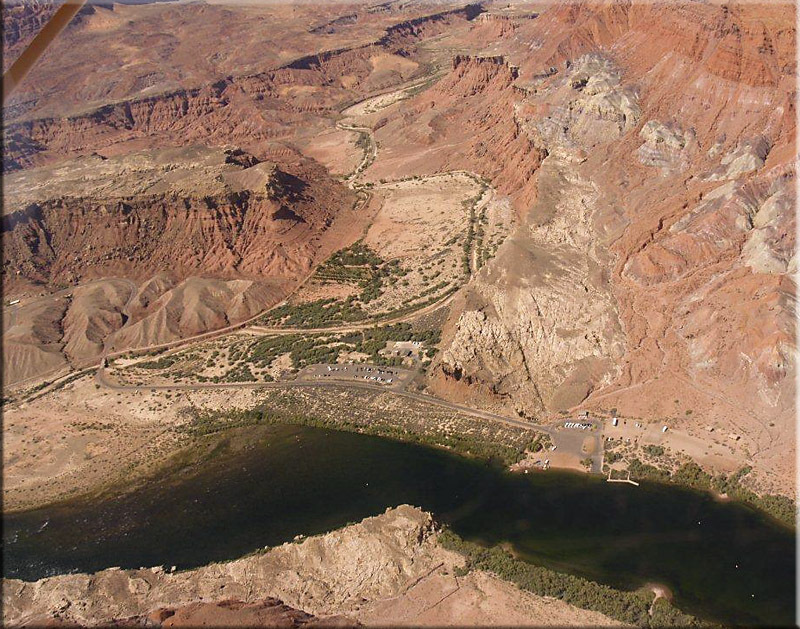 The next morning, we got up early and loaded our bags into a 14 passenger van for the trip to Lee's Ferry, just south of the Glen Canyon Dam. We had a stop at Walmart for last minute supplies. The evening in the Riverhouse and the van ride were a chance to get acquainted with our rafting partners. Dana was Dan's cousin and Rus and Warren were Dan's friends, all from the Pacific Northwest. Mitch and Layla, and Dennis and Irene, were friends of Dan's from Arizona. Mark and Amber, as well as Mike, Leo, Brent and Paige, and Brian had been invited by the outfitter. Most were hotshots and were very comfortable in a camping situation. Brent, Paige and Brian would join us a week into the trip hiking down into the canyon. At that time, Dennis and Irene would be hiking out. 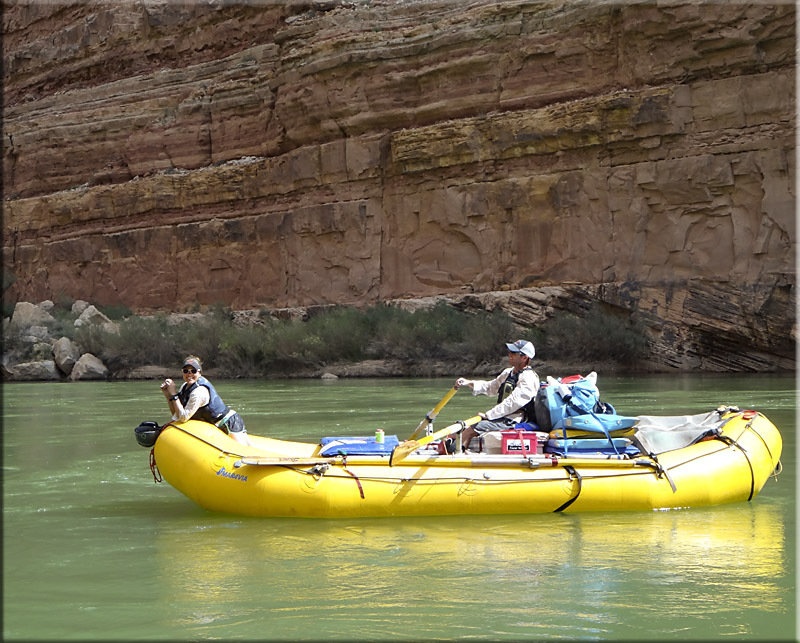 Mitch and Layla load their dry bags. Kim photographs the Colorado River from the Navajo Bridges. 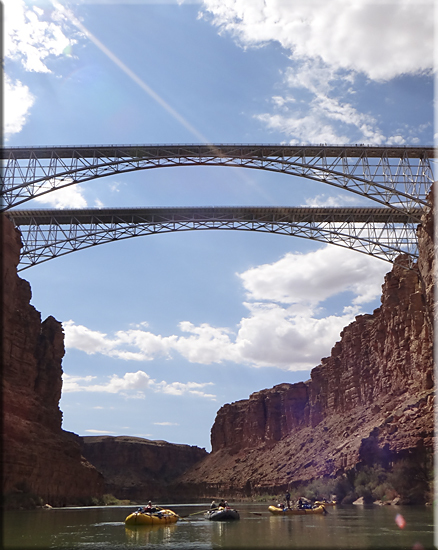 The Colorado River seen from the Navajo Bridges. Note the Coconino Sandstone which can be 350 feet thick. 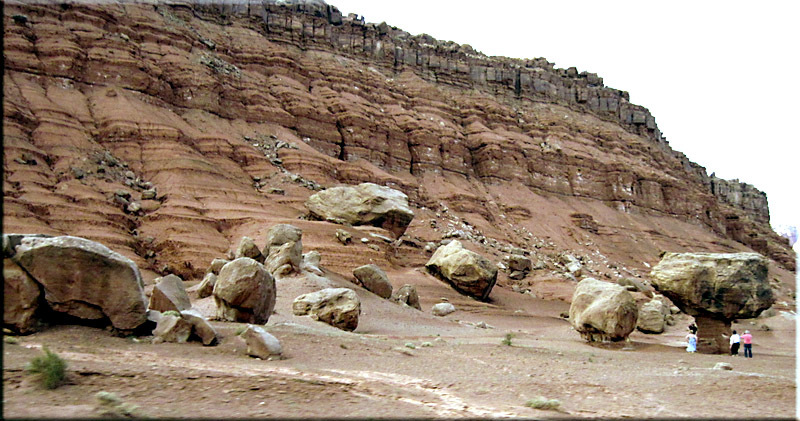 In our descent to the river, these rocks are all that remain of mountain material that eroded away. Note the boulder still stubbornly perched on what is left of its pedestal. Our put-in destination was Lee's Ferry, specifically the boat ramp. Our first night was instructional, and we camped in the brushy area to the left of the boat ramp. Photo: Charlie, from his airplane. 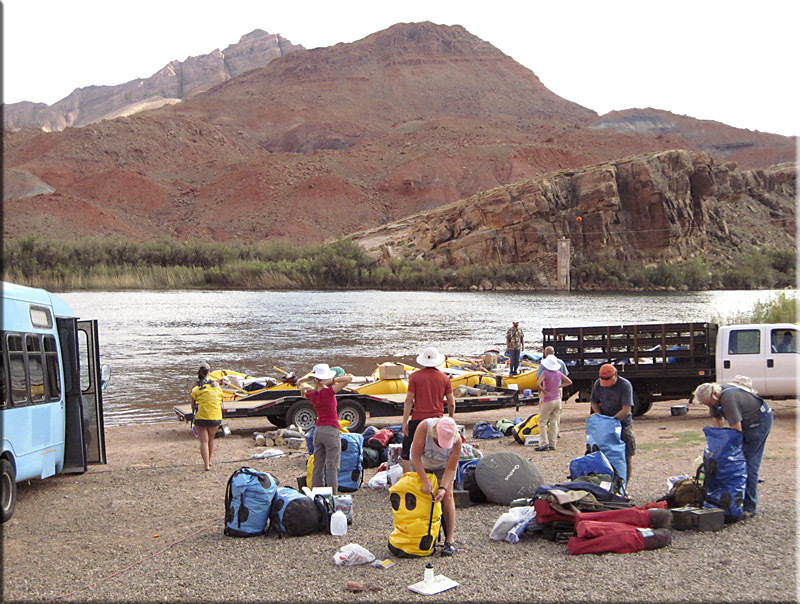 At the river, we found our rafts assembled, awaiting the loading of our personal gear. Our dry bags were creased and folded at the top and cinched down. If done properly, it makes a watertight seal. Scott was our instructor for the next 15 hours. 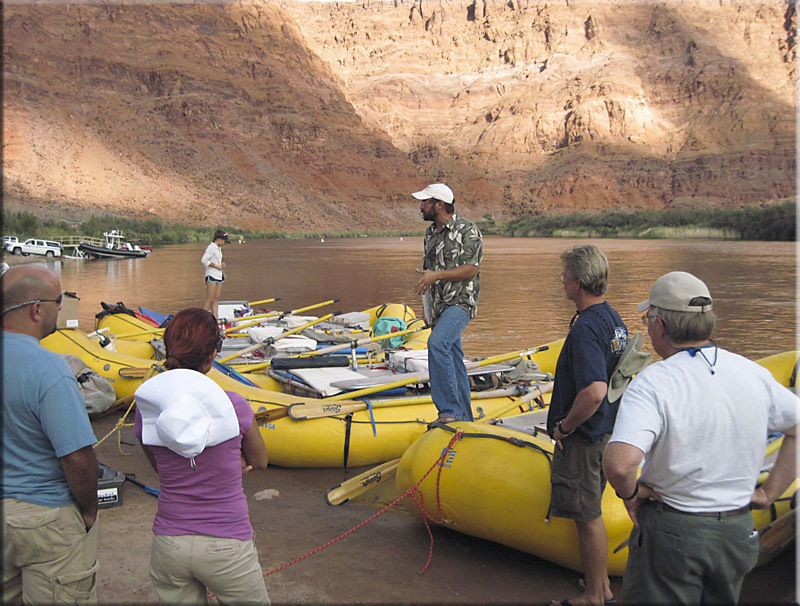 He showed us how the gear was stored on the rafts and how it was organized. 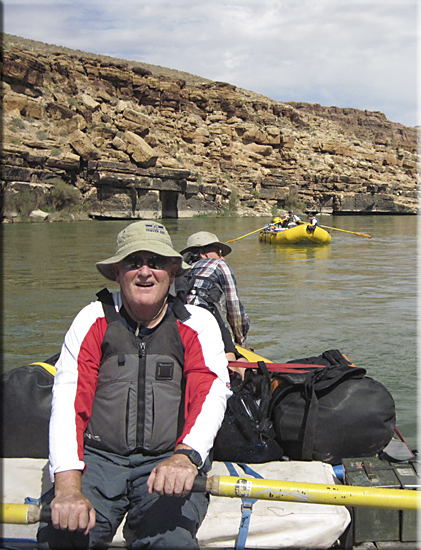 He gave us very general instruction on paddling and running rapids. 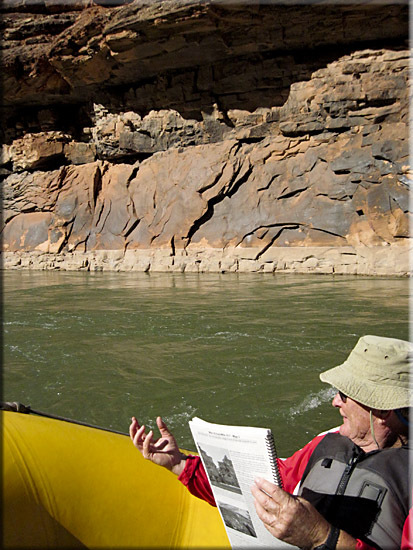 We had guidebooks with specific instructions on rapids and other river guidelines. 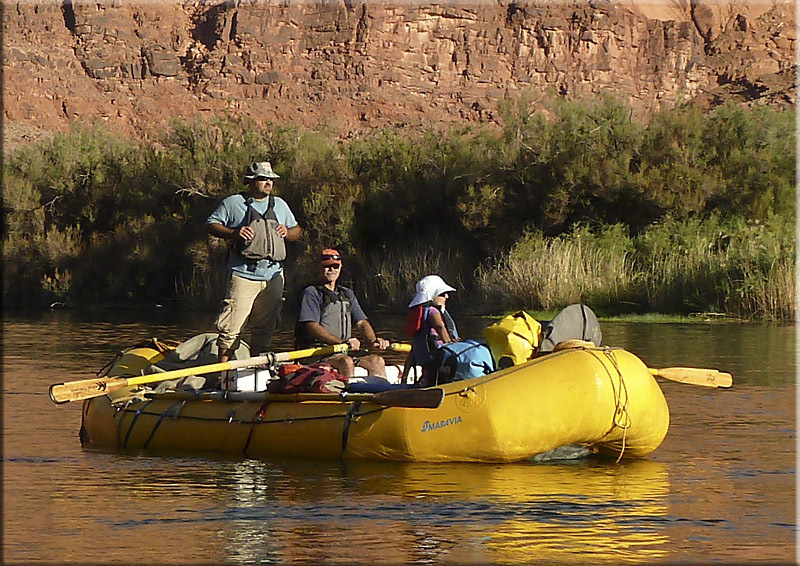 After a couple of hours, we loaded our bags on the rafts and got a small chance to paddle as we drifted a mere 100 yards to our campground for the night. In the photo, Dennis and Irene, Scott, Dan and Charlie. Amber is in the background. She is an administrator for Moenkopi and joined us with her husband, Mark, for the trip. She proved very helpful in explaining how things were organized as well as suggesting things to see and things to avoid along the river. 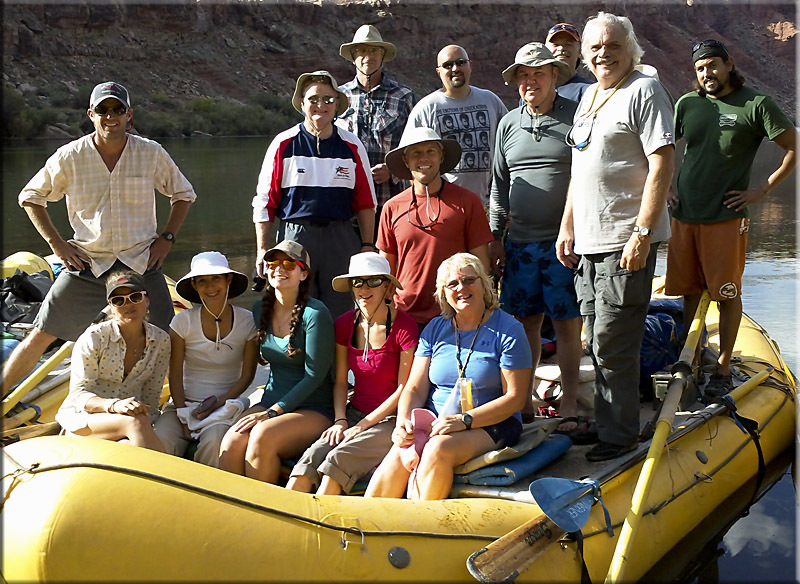 The obligatory group shot at the start of a 280 mile raft trip. Scott showed us how to set up camp, particularly the kitchen protocol. He cooked us a huge breakfast, and then went through the careful procedures for breaking down camp without leaving any trace of our presence behind. On the river at last, Charlie takes the oars. Under the oarsman's seat is a huge ice chest with frozen food. Under the bags behind and the forward bench are compartments containing cases holding the other necessary food, energy and convenience items. 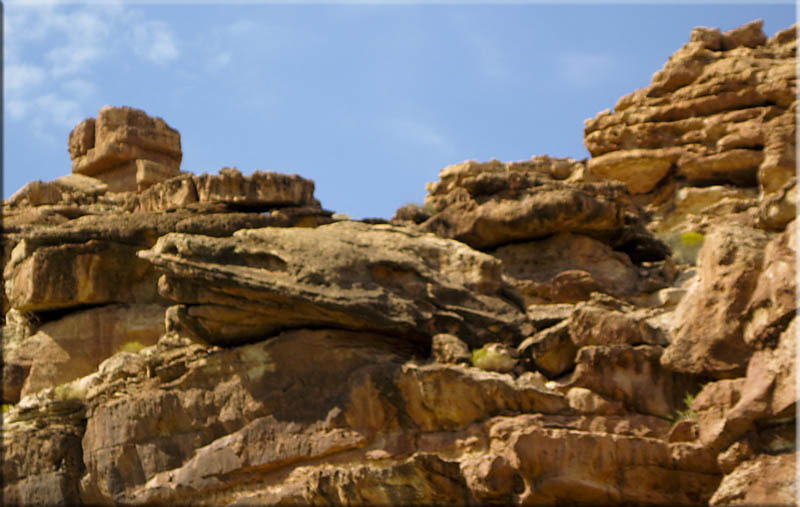 We were immediately struck by the many shapes worn into the rock, here an aligator situated below a castle turret. Five miles down river we pass under the Navajo Bridges, the old one nearest for pedestrians, and the new one for vehicles. Dan Youngs organized the trip. 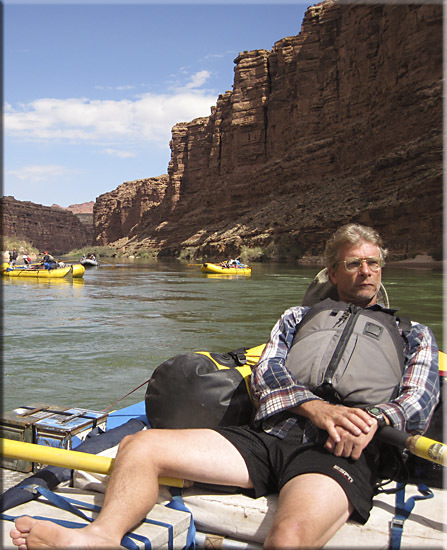 He has for years hiked into the Grand Canyon and never tires of uncovering its complexity. It was not long before the 100 degree temperatures were having their effect and the water guns came out. It is remarkable how an unexpected soaking by 52 degree water takes the edge off the heat. 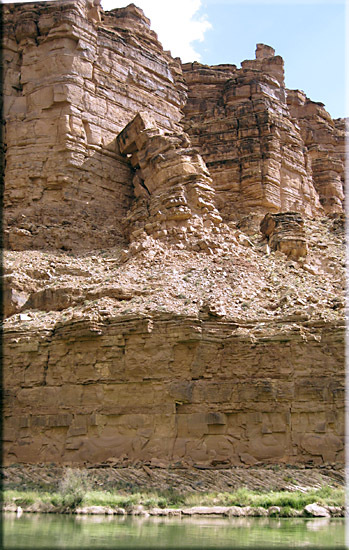 A Kaibob Limestone tower awaits its moment in geologic time when it will topple into the river and become another rapid. 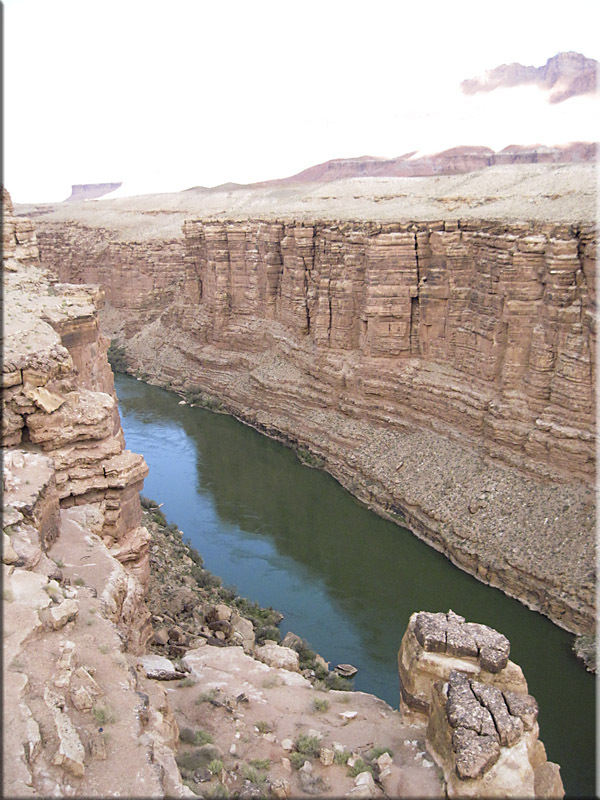 "Guide to the Colorado River in the Grand Canyon" by Tom Martin and Duwain Whitis, proved an essential map book, complete with photos and descriptions of what was coming up. It also described the best way to run significant rapids.